November 2, 2009 Dan O. Never would I have thought that a film starring Shia LaBeouf be one of the most gut-wrenching films I have ever seen. Now this film is directed by the same person who wrote the memoir it is based on, and I must say there is basically no one else that can direct this other than Dito Montel, in his directorial debut. The film is told through flashbacks, though it is set in the present, and I really did like the way it was filmed. I felt like it couldn’t have been filmed either way. We really do understand these characters right from the get-go, and we start to understand the occurrences that caused Dito to leave his New York home grounds. I was reading other reviews before I saw this film and so many people we’re just bashing it for going a little too far with N.Y. City stereotypes. To be truly honest I think since this is Dito’s film, and he basically wrote the story, I think he would know how everything really was around New York. I love coming-of-age tales, but this one really ranks high with one of my favorites of that category. The whole humanity and the realism of this film is captured through it’s screenplay. The screenplay is very realistic, showing all sides of comedy, drama, and most of all, tragedy. The film really doesn’t fail at all with it’s screenplay and never goes too far with it’s cliches. Shia LaBeouf is very good in this and shows his talents in acting, that would come to benefit him later on his career. The whole cast all do amazing jobs but the one who really stands out in my mind is Channing Tatum. I felt like this film would have not succeeded if they had somebody else playing Antonio. Tatum is tough as nails, but also very troubled and you can see that in Tatum’s performance as he plays someone different then the usual big tough guy he does in all of his other films. The only problem I had with this film was that when it was all said and done I felt like there were more aspects of Dito’s life that weren’t covered and just forgotten that could’ve really helped this film out, but not that much of a complaint after all. Consensus: One of the most powerful and realistic coming-of-age films I have ever seen. 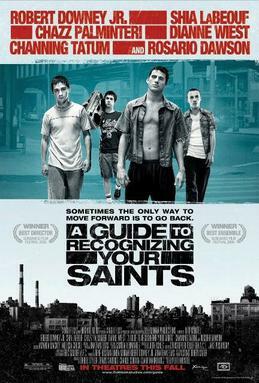 A Guide To Recognizing Your Saints, is well-acted, sharp direction from new-comer Dito Montiel, and paints a wonderful portrait of what friendship really means. Yep, that Shia LaBeouf thing shocked the !@#$@! outta me too. But he wasn’t half-bad in “Disturbia” (a semi-decent movie for the first half), so I think maybe I should give him another chance. For me, though, Downey Jr. made this movie. But he makes most every movie he’s in, so maybe that’s not saying much. Yes, I did forget to mention Downey Jr., but that’s basically a given that he could make any film. Thanks for the comment, and nice site! To me, this film is a perfect example of how powerful acting can take a mediocre script and turn it into something well worth-watching. The scenes between Shia LaBeouf and Chazz Palmiteri are the most powerful of the film and it is one of the most engrossing father-son relationships I have seen in a movie in quite a while.